I have published package “Epigent DTangler Dependency Analysis” (version 1.14) to the Cincom Store Public Repository. This package allows using DTangler in VisualWorks Smalltalk to analyze dependencies on packages and bundles. I want to thank the authors of DTangler for assisting me with this work. Install DTangler from this page. Load package “Epigent DTangler Dependency Analysis”. Set the installed location of DTangler using Epigent.DTanglerDependencyAnalysis.ExecutableInterface class dTanglerFolderName: Alternatively, set the location from the “DTangler Launch Screen”. Select a bundle or a set of packages in the System Browser. 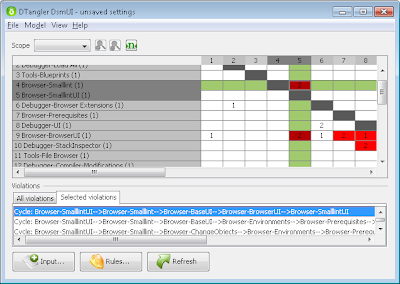 Right click and select “DTangler Analyze Dependencies”. Compiler evaluate: 'Parcel loadParcelByName: ''StoreForPostgreSQL''. detect: [:each | each name = ''Public Store Repository'']).'. Compiler evaluate: '(Store.Package mostRecentVersionOfPundleWithName: ''Epigent DTangler Dependency Analysis'') loadSrc.'. Runar, this definitely looks cool. This is a topic of great interest to me, getting Smalltalkers and their technology to do a better job of building modular software. Module boundaries and dependencies is something you have to embrace to do it right, you can't hide behind the crutch of the object soup that is the image. Which version of my package do you use? Version 1.15 corrects one bug with starting up DTangler. Try starting DTanger stand-alone before starting it from VisualWorks. Could you try with version 1.15 of my package, and mail me back the error? DTangler is designed to have minimal dependencies to make it easy to integrate to development environments. All you need is Java runtime 1.5 or newer. The non-GUI console dtangler is just one jar. The GUI version uses the forms-1.2.0.jar which is included in the download. NoClassDefError is probably due to us not testing the startup script dsmgui.sh on OSX, sorry 'bout that. You should be able to start dtangler GUI if you run java with options that put the two jars (forms-1.2.0.jar, dtangler-gui.jar) in the classpath and use org.dtangler.swingui.app.Main as the main class.